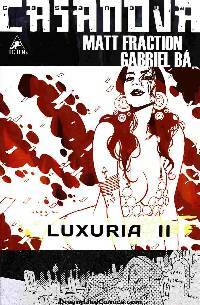 CASANOVA: LUXURIA continues! Strange, sweaty, naked things are afoot deep in the jungle metropolis of Áqua Pesada. A rogue E.M.P.I.R.E. agent has gone mad and, in between throwing the most decadent parties the world has ever known, spills his spy-guts out in the pages of a breathless, confessional, comic book... and Casanova Quinn is given orders by his father to bring the agent in... but Newman Xeno wants Casanova to kill him instead. Bloodshed, betrayal, a trial, an exile, a Paco Rabanne dress made entirely out of credit cards, and a shocking twist that sets Casanova irrevocably on a path of no return. 32 PAGES OF COSMIC COMIC SPY-CHEDELIA. All new back-matter! Soul-elevating colors! Staples and paper! READ!